I love making quick and delicious versions of classic recipes. 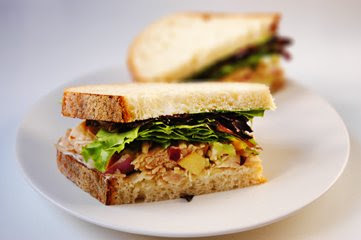 We were on our way to the beach this weekend when I decided to whip up some Chicken Salad Sandwiches for lunch. This recipe differs from classic Chicken Salad because it doesn’t contain mayonnaise, and it has bits of apples and sage…Yum! 2 cups cooked chicken. I use grocery store bought roasted chicken. Shred the chicken in a bowl. Mix all of the vegetables, garlic, sage, lemon zest, and apples. Make vinaigrette. Whisk together the oil, mustard, and vinegar until emulsified. combine vinaigrette with chicken, add salt and pepper to taste. Enjoy! we had it on sourdough bread and a bit of mesculin, but you could have it with crackers, on a bed of greens, etc. I would definitely use a sweet apple…the vinaigrette is already a bit tart because of the white wine vinegar….the sweet bits of apple offer a nice counter! Chicken salad with no mayo! right on! Would you use a sweet apple or a tart apple in this? Thanks Nurit! I really appreciate the link! I love your blog! Added it to my blogroll too, BTW. Thanks for the beautiful photos and tips ;-), and recipes. Quite delicious & perfect for spring.Even caught my hubby eating it by the spoon-full. Thank you!